Conservatory senior transforms an archaic art form into a modern musical drama. Imagine standing in a European cathedral, where a crowd has gathered to celebrate the “Feast of Fools” and watch a performance of the musical Ludus Danielis. As lords and ladies jostle for position among the peasants, the performers begin their slow march toward the altar—solemnly intoning the praises of Daniel, the play’s main character, while waving aloft brightly colored glass bottles. Oberlin’s Root Room is no medieval cathedral, but the reenactment there of this 13th-century musical drama in January transported audience members to another place and time. Featuring seven Obie musicians and 22 vocalists, the play was produced and directed by senior composition major Mary Larew, who credits Oberlin for nurturing her experimentation with such a difficult musical genre. Larew, who graduates in May, belongs to an elite group of students awarded one of the highest accolades a U.S. undergraduate can earn: Great Britain’s Marshall Scholarship, which covers two years of graduate study in the United Kingdom. The fourth Oberlin student to win the Marshall since 1990, Larew plans to pursue an MA in vocal studies at York University, focusing on ensemble singing. 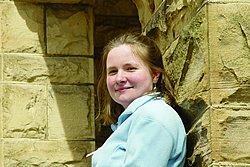 Her interest in medieval music began at Oberlin with a concert by the Collegium Musicum. The all-student vocal ensemble, directed by Professor of Musicology Steven Plank, specializes in Renaissance and early baroque music. Larew joined the group and eagerly threw herself into the study and performance of medieval melodies. In addition to directing Ludus Danielis, Larew composed instrumental interludes and supplied vocalists with instructions for multiple voice parts—thus creating harmonies that were never a part of the original score. She was also diligent in studying the performance conventions of 13th-century music dramas. On campus, Larew is cofounder of Uncloistered, an a cappella, early-music quintet specializing in Renaissance poly-phony. She has recorded with the 15th-century music ensemble Ciaramella and studied with a British a cappella vocal ensemble, the Tallis Scholars, at its summer school in England. With journalists predicting political mayhem and environmentalists quoting Winston Churchill, Oberlin alumni are sending a unified message: President Bush’s second term will bring tough battles for the nation. Fifty alumni and winter-term students came together at the National Press Club in Washington for “The State of Our Nation: Oberlin Perspectives.” The panel discussion, a reprise of the post-presidential election event held four years ago, featured alumni with diverse—and vociferous—views on the political prospects during the next four years. 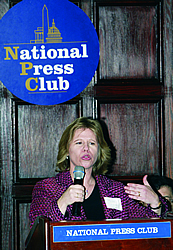 Holly Fechner ’85, primary adviser to Massachusetts Senator Edward Kennedy on issues ranging from the economy to civil rights, criticized the Bush administration for undercutting protections in the workplace, placing the burden of the economy on workers and families by encouraging profits over jobs, and taxing wages, not wealth. “The idea that you can work full time in the United States and still live in poverty should be very troubling to all of us,” she said. Spectators were intrigued by the common mission that unified the otherwise diverse group of Washington Obies. “Here in DC, you hear so many talking heads; it was interesting to get an unvarnished perspective,” said Regional Alumni Coordinator Andrew Harrison ’02, an international trade specialist at the U.S. Department of Commerce.